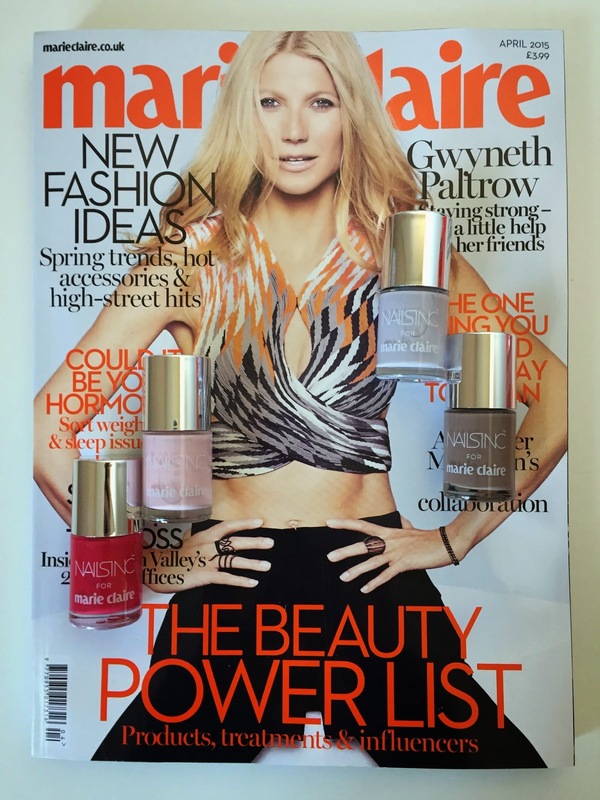 In April’s Issue of Marie Claire magazine the freebie is a full size bottle of Nails Inc London nail polish!!! There are 4 colours to collect & in total are worth £44!!! It was quite a mission trying to find all the colours as the magazine went on sale a day early. I went to get the magazine on its official release date & most shops had sold out or only had a couple of magazines out on display. In most of the shops I went to the nail polishes had been stolen out of the magazine, which I always find so frustrating & annoying. In the end it took me 2 days of looking round shops to find all the colour nail polishes. I got two magazine from WH Smiths, one from Tesco & one from Lidl. I wish I would of gone to Asda first because they are selling them for 2 for £6 which is a bargain. When I went into Asda I already had the colours they had on display. Marie Claire magazine costs £3.99 normally. Check out Marie Claire’s website http://www.marieclaire.co.uk & follow Marie Claire on Twitter https://twitter.com/marieclaireuk. If you manage to buy all 4 magazines you are making a HUGE saving, because it would only cost you£15.96. When each Nails Inc nail polish is worth £11, so you are making a saving of £28.04!!! The Nails Inc nail polishes have been created especially for Marie Claire magazine. Which means you can not buy the 4 exclusive colours anywhere else. The Nails Inc for Marie Claire nail polishes are perfect colours for spring & I can’t wait to use them throughout the season. Are you thinking of picking up any of the Nails Inc for Marie Claire nail polishes??? or have you already bought the magazine??? If so whats your favourite colour nail polish??? ‘Fashion’ is a gorgeous pastel grey/ Lilac colour. In the bottle it looks more like a lavender colour. I have already repainted my nails quite a few times over the last couple of weeks. I’m obsessed with the colour ‘Fashion’. Pastel colours are always really popular in the spring/summer, so you can not go wrong with this colour. ‘Fizz’ is such a cute colour. Its a baby pink that Marie Claire describes as “Cotton Candy Pink”. I’m going to be using the colour ‘Fizz’ as a base colour for a DIY French manicure. ‘Fiesta’ is a hot pink colour. ‘Fiesta’ is such a vibrant raspberry pink colour & is a perfect colour to wear when your going on a night out. ‘Festival’ is the darkest colour out of the four colours. The only way I can describe the colour is that its like a tree trunk brown. I have never really worn darker brown colours on my nails before. I normally stick to taupe colours. I think that ‘Festival’ is more of an autumn colour than a Spring colour, but I will be using ‘Festival’ for nail art. In the photo above is swatches of the Nails Inc for Marie Claire nail polishes. From Left to Right the colours are Festival, Fashion, Fizz & Fiesta. The colour pay off is great even with one coat of nail polish. I’m really impressed with the Nails Inc nail polishes & would definitely recommend you buy Marie Claire magazine, so you can get your hands on a fabulous freebie.